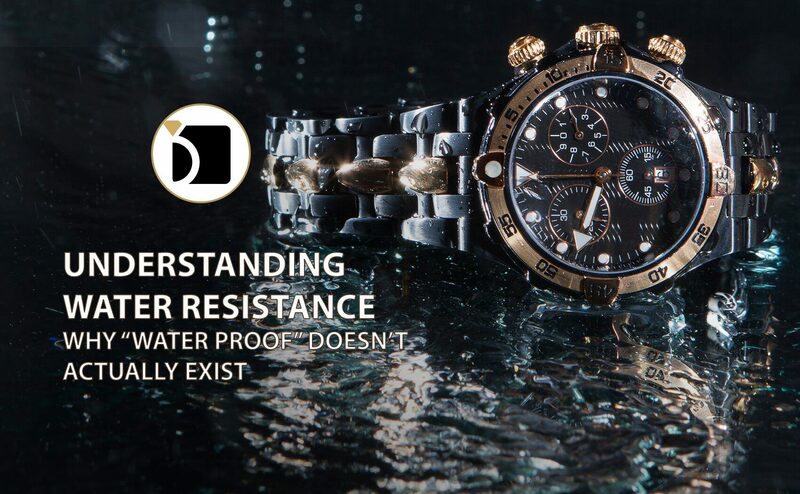 Water resistance for watches is a very confusing topic for most people. Many believe that water resistant means water proof, and nothing is farther from the truth. In fact, no watch should be called water proof since it implies that water will not be able to enter the watch under any circumstance, and there is a limit to the amount of water pressure a watch can withstand. There are levels of water resistance, and these levels can be expressed in different terms, for example ATM (atmospheres) or meters are the most commonly used as well as bars, and feet. How do you know if your watch is water resistant, and to what level? Most watches have the water resistance level stamped on the case back, and some even have it on the dial. If the watch is just marked water resistant without a level, then it is considered splash resistant and should not be submerged in water. Why is this important? If the watch movement (or the time keeping mechanism) is exposed to water or moisture it can be damaged. It is important to know that water resistant watches have gaskets that prevent water or moisture from entering the watch, and over time these gaskets can become worn or damaged and no longer protect the watch. Most watches have at least 3 gaskets, the crystal gasket, case back gasket, and crown gasket and if your watch has additional buttons for advanced functions these buttons would also be protected by a gasket. Protecting the gaskets from damage can prolong the water resistance of your watch, so watches should never be exposed to a sauna or hot tub, since exposure to heat can easily damage the gaskets, and never be worn in the bath or shower since soap can also damage the gaskets. Anytime the case back on a watch is removed, there is a chance the gasket can be damaged. A battery replacement service is the most common reason for the case back to be removed and therefore a pressure test should always be performed when a battery replacement is done on a water resistant watch to ensure it remains water resistant to the specified level. For more information on water resistant watches and how we can repair them, please click here.